USB drives increase the mobility of documents and applications, but viruses and other threats can also infect computers through USB drives. For protection against mobile viruses, TrustPort USB Antivirus (portable) may be what you need to protect yourself and your company. The USB edition of TrustPort Antivirus USB is unlike its Desktop counterpart in that this edition uses a single detection engine, the Norman. In addition to real-time protection and on-demand protection when running this antivirus application portably, TrustPort Antivirus USB can scan emails and web sites. TrustPort Antivirus USB Edition 2017 17.0.3.7038 is a shareware program and can be used as a demo to try the software until the free trial period has ended. A full version of the program is available after the trial period ends. For security reasons, you should also check out the TrustPort Antivirus USB Edition download at LO4D.com which includes virus and malware tests. Additional screenshots of this application download may be available, too. 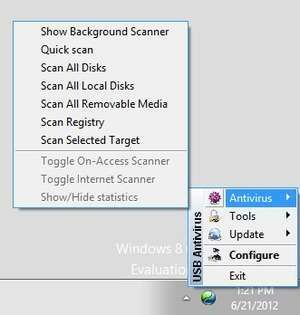 TrustPort Antivirus USB Portable has a presence on social networks.